Goldscheider of Vienna now has a greater prominence at WMODA museum thanks to the generosity of Arthur Wiener and other keen collectors. The Goldscheider family first became involved in the ceramics business in the 1870s. 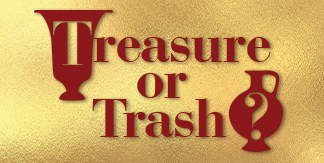 One of their ancestors was the foremost gold refiner and alchemist in Prague during the 16th century so perhaps it is apt that the family became involved in the porcelain industry, which was pioneered in Europe by alchemists. Friedrich Goldscheider moved to Vienna in 1878 where he opened a porcelain shop and later a factory. By 1885 it was known as the Goldscheider Porcelain Manufacturer and Majolica Factory. 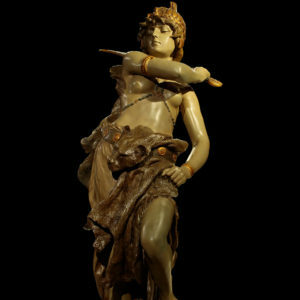 Friedrich’s motto was “Standing still is the beginning of the end,” and he quickly established a reputation for his artistic terracotta sculptures at the trade fairs and exhibitions of Europe. 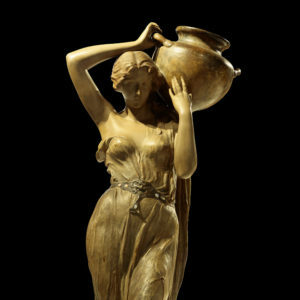 At the Paris Universal Exposition in 1889, Friedrich won a gold medal and more first class awards followed in Edinburgh 1890, Trieste 1891 and Dresden, where he launched his patented process for patinated bronzed terracotta. This process gave clay the appearance of bronze which was considered a more “noble material”. 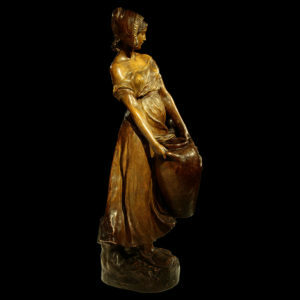 In 1891, Friedrich also opened a bronze factory in Paris in order to draw on the finest sculptors in the art world. His German artist’s names were Gallicized for the fashionable French market, for example Fischer became Pecheur and Schoerk became Cherc. 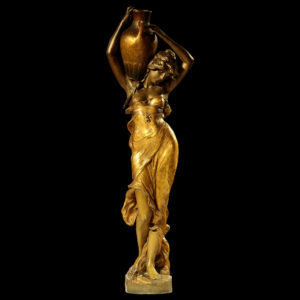 At the 1893 Chicago World Fair, Goldscheider exhibited both bronze and bronzed terracotta sculptures to great acclaim. Branches, studios and retail outlets were established in Leipzig, Berlin, Paris and Florence and Goldscheider was exporting to “all countries and continents.” After building his business into a world-renowned brand, Friedrich died in 1897 at the age of 52. 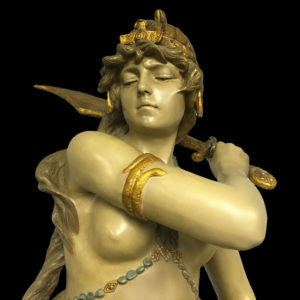 At the ground-breaking Paris exhibition of 1900, the Goldscheider factory presented statues, busts and vases with subjects ranging from European heroes to exotic Moorish-Oriental figures to classical maidens in flowing drapery. 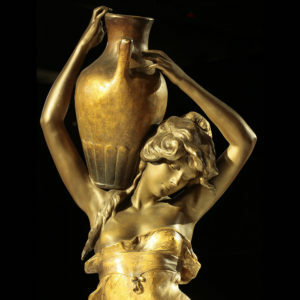 Woman in all her wiles was the dominant theme in turn-of-the-century decorative arts and the Art Nouveau gallery at WMODA features several large bronzed statues of water carriers by Cherc, Haniroff and Gross, together with an imposing sculpture of the Queen of the Amazons. 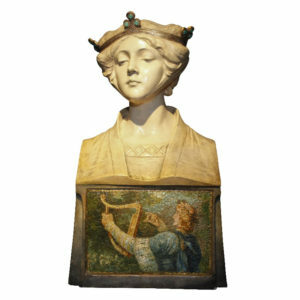 A particularly popular exhibit is Pecheur’s terracotta bust of a young queen on an imitation mosaic base developed in 1904. 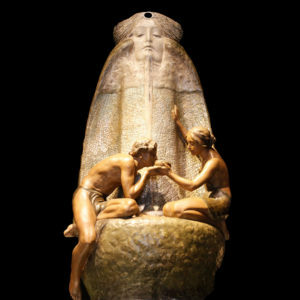 A monumental vase featuring the new crackle decoration created in 1912 depicts Adam and Eve drinking at the fountain of life.